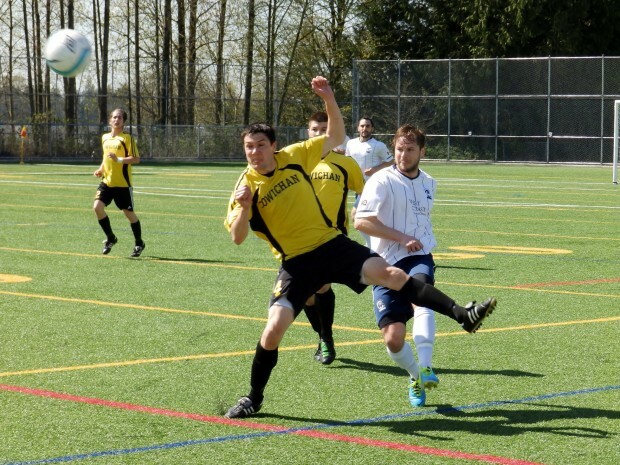 The action continued apace in the 2014 BC Provincial Cups on Saturday with goals galore in the first round matches. AFTN continued our travels around the lower mainland to take in a game in both the A and the B Cups. 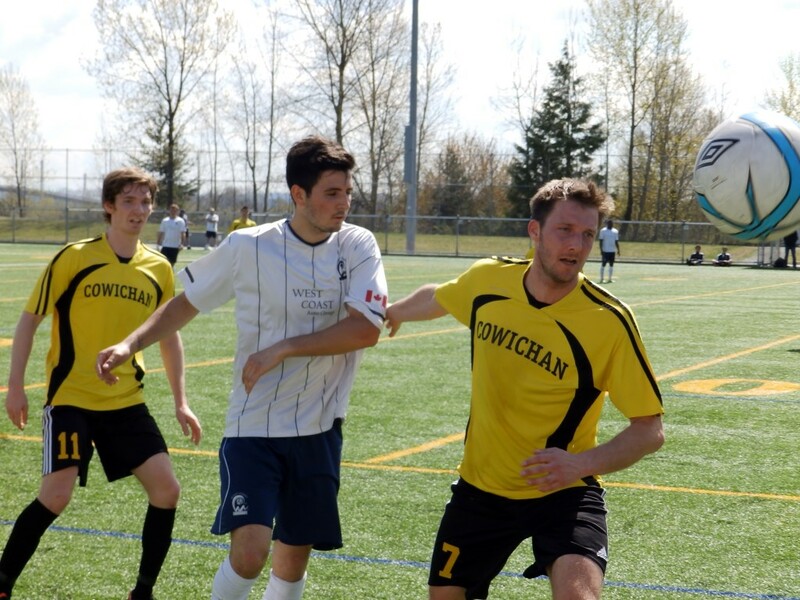 Pitt Meadows was the first stop at noon as the Fraser Valley Soccer League’s Westcoast FC Selects played host to Vancouver Island’s Cowichen FC, running out comfortable 3-0 winners despite playing most of the second half a man down. Westcoast looked in control for most of the match and although they didn’t create the majority of the chances, they did what they needed to do, took theirs and looked like they could up a gear at any time. Cowichen only have themselves to blame as they enjoyed the majority of possession as they chased the game and created some great chances which they squandered, failing to push home their man advantage. The home side opened the scoring in the 10th minute after Cowichen goalkeeper Joel Wilson scuffed a clearance straight to Jonny Craig and with the keeper out of position, the Westcoast striker had the easy job of stroking the ball home. Cowichen tried to take the game to their hosts and should have levelled just before the half hour mark when a break up the right saw the ball played perfectly across the goalmouth and with the net gaping Connor Crichton blasted over from five yards out under pressure from Kasrah Lohrasb. The visitors tried to chase the game but it was a fairly even contest. Cowichan’s earlier miss was punished in emphatic fashion in the last minute of regulation when Craig grabbed his second of the game, rising well to head home a Cole Almond cross from the left. The VISL side will have felt a bit aggrieved as it was never a two goal game but their cause was given a huge helping hand four minutes into the second half when Westcoast’s two goal hero Craig, picked up two yellow cards too and was sent off for a second bookable offence after a 50/50 tackle. It was a very soft yellow, to go with the soft one he picked up in the first half, with the noise of the two players coming together likely to have played a part. His loss for the quarter final game will be a big blow to Westcoast. Cowichen started to control possession and were carving out a few chances, but they couldn’t convert them. Brad Thorne played the ball back to Kevan Brown on the hour mark, but he pulled his shot just past the left hand post. Westcoast dealt comfortably with the pressure and kept pushing forward themselves despite the man disadvantage, looking dangerous when they did as the visitors started to leave holes at the back. Cowichen should have pulled a goal back with six minutes of the match remaining when Ryan Andre hit the byeline and sent in a perfect cross to the middle for Bram Taylor eight yards out but he blasted high and over with the goal gaping once again. A goal for the visitors would have changed the whole complexion of the closing minutes of the match but if Cowichen needed any proof that it wasn’t to be their day it came in the 88th minute. Steven Scott flicked the ball out wide to Matt Arnett who centred perfectly for Andre. The sub did everything right but saw his shot cannon off the post. The rebound came back to him but he could only look on in anguish as that also crashed off the post. The result was never in doubt now but Westcoast put the icing on the cake when Paul Piche broke clear two minutes into stoppage time and coolly finished low past Wilson to make it a 3-0 final. Yesterday we said that the West Van-CCBRT game had everything apart from a red card and a dog on the pitch. Bizarrely, this match had both! You can see highlights of the game (including two of the goals) below and photos from the match are on our Flickr page. Westcoast Selects now travel to Vancouver to face Inter FC in the quarter finals. Inter beat fellow VMSL side Columbus FC 1-0 on Saturday in a rematch of last month’s Imperial Cup final. The other quarter final in the top half of the A Cup draw will see an all VMSL clash, as West Van play host to Croatia SC, who beat FVSL side Abbotsford Magnuson Ford Utd 4-2 on Saturday. 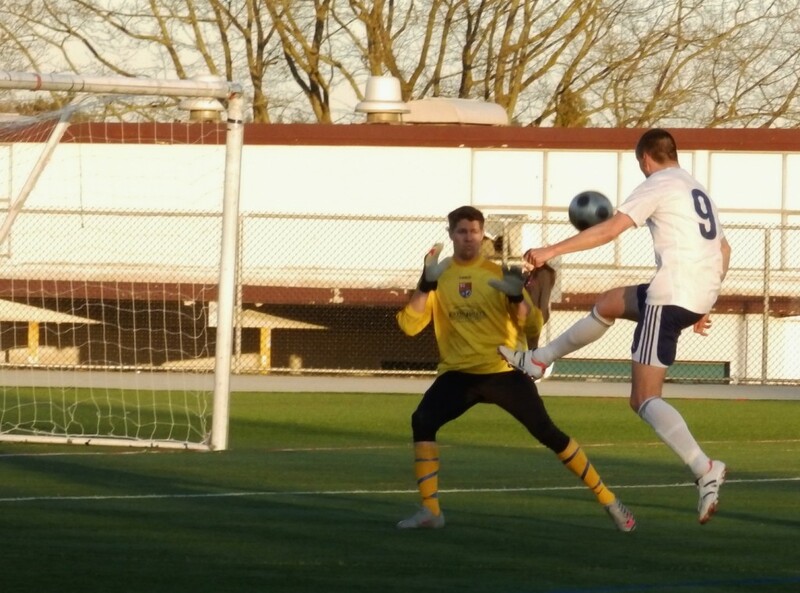 With three matches in the bottom half of the draw taking place on Sunday, the all FVSL tie between Port Moody Lordco Gunners and Langley United took top billing. The Gunners had won the FVSL Premier title from United by a single point, but Langley got some revenge with a 4-3 win in a pulsating match. For our second game of the day, we turned our attention to the B Cup and continued our “Road To Burnaby Lake” plan by taking in the clash between BMSA side Europa FC and the visiting VMSL’s Bombastic FC. We watched last week’s Preliminary Round tie between Rino’s Fury and Bombastic and the plan is to follow the winner from each round all the way through to the final on May 11th, since none of the ties will be in the island. It was a close match throughout with Burnaby side Europa having the better of the chances and possession. They looked the team most likely to break the deadlock, although it took a late penalty for them to do that and advance through to the quarters. The home side had a scare 11 minutes in when Jason Pierotti went down in a challenge and seemed to dislocate his shoulder but he was able to pop it back into place. There wasn’t too much goalmouth action in the first 45, mainly half chances for both sides. Pablo Clinaz had a shot tipped over by Bombastic keeper Adam Guthridge as the half hour mark approached and Luke Dorn came close with a shot for the visitors, before Europa keeper Eric Shepperd did well to smother a close range shot with a few minutes of the half remaining. The biggest excitement was whether Europa could find the box to switch on the floodlights. They eventually did as half time approached and the light was fading! Europa were creating the better chances in the second, with Bombastic struggling to find any way through or get much attack going. Last week’s goalscorer Pat Blennerhassett had the ball in the net for the VMSL side in the 72nd minute but he was offside as he looped the ball in. As the night became chilly, it looked like the game was heading to extra time but things were to warm up. The match had penalties written all over it from early in the proceedings and as it turned out it was one of them that proved to be the deciding factor. With five minutes of normal time remaining, Alessandro Messina hit the byeline and cut the ball back to Sandro Kovacevic, who was chopped down from behind and the referee pointed to the spot. It seemed a little harsh from our angle. Malcolm Wallace stepped up and fired the ball past Guthridge for the game’s opening and winning goal, which you can watch below. Bombastic staged a late surge for the equaliser but the closest they came was when Sheppard had to make a sprawling stop to keep out a back header from his own player Trevor Clark in stoppage time. It wasn’t a classic, but the 1-0 win for Europa will now see them host a quarter final match up with another VMSL side, Division 2C champs Metropolitan FC, who finished the regular season undefeated in their league. Metropolitan beat Island side Cordova Bay Red Barn Bobcats 2-0 in Saanich on Saturday and have scored five goals now without reply in their two matches in this year’s competition. Defending Champions, Richmond All Blacks, were also on the island and came away with a hard fought 1-0 win over Fernwood Town thanks to a second half goal. They will now be at home in the quarter finals to FVSL side Surrey FC Temple United, who saw off VMSL B Cup winners, FC Romania 2-1 on Saturday night. Saturday’s remaining B Cup match was an all FVSL affair with Langley United Sparta running out 4-1 winners over Westcoast FC Celtic. The match finished 1-1 after 90 minutes, with the home side scoring three goals in extra time to clinch a quarter final berth, where they will host the winner of Sunday night’s NK Hrvat-Richmond Athletics clash. You can see all of Saturday’s results, and the results and schedule for all games in the Men’s A, B, U21, Masters and Women’s so far, on the BC Soccer site. A few games still to come on Sunday on both the island and mainland. All the details are in the link above, so get out and support local soccer if you can.